Scott Cawthon, the game developer best known for creating the game that had the entire internet talking about it nonstop for months, Five Nights at Freddy's, recently announced a new installment in the FNAF series, however, it won’t be what you are expecting. This new title from ScottGames will be entitled Five Nights at Freddy's World, and it will be available in 2016 for Windows, Android and iOS devices. Generally, when someone mentions the name Five Nights at Freddy’s, you may think of a game with a somewhat confusing plot and a lot of jump scares, but, that will not be the case for this next installment. Instead of having the player take control of a young child or a security guard, this game will be all about role-playing. 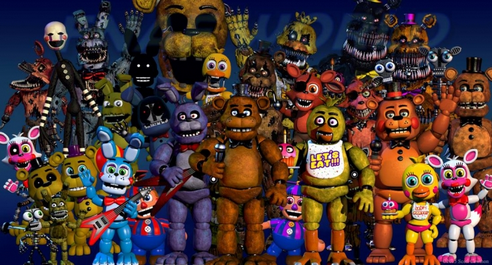 You, as the player, will have the ability to create your very own parties and events with the animatronics and other characters that we have been introduced to as the series progressed. Other than that, nothing else is really known about this upcoming project. Cawthon wanted to make it clear that this will not be a sequel to Five Nights at Freddy’s 4. Actually, according to Scott, there will never be a fifth installment in the series. It was revealed that the fourth game is the end of the story. You may be asking, what’s the point in even making a FNAF RPG? "I wanted to use these characters in a new and fun way because they are so near and dear to my heart, and I was excited to work on a type of game that I hadn't made in a long time," said Scott when he was asked about the game’s creation. God, MoMo, Zelkaar and 1 other person like this.